His sister Dora shared the news on Twitter. 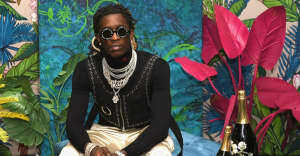 Young Thug's sisters Dora and Dolly are clearly a huge part of his life and career; Thug has immortalized them in both song and video already. Early this morning, Dora took to Twitter to share the news that Thug will be appearing on the upcoming Suicide Squad original soundtrack from Warner Bros. Representatives for Warner Bros./ DC Entertainment and Young Thug were not immediately available for comment. Did you guys know Jeff(@youngthug) did a song on #SuicideSquad soundtrack?!? !